MSC Malaysia status is recognition by the Government of Malaysia through the Malaysia Digital Economy Corporation (MDEC), for ICT and ICT-facilitated businesses that develop or use multimedia technologies to produce and enhance their products and services. It is also a mark of world-class service and achievement and the passport and gateway to a host of privileges granted by the Government of Malaysia. Zilzar is proud to announce that we have been awarded the MSC Malaysia status as of November 2016. Kuala Lumpur Malay Chamber of Commerce (KLMCC), better known as 'Dewan Perniagaan dan Perusahaan Melayu Malaysia Kuala Lumpur’ (DPMM Kuala Lumpur) was officially launched on April 30, 1975 to aid and support Malay entrepreneurs. Both parties have agreed to sign a Memorandum of Agreement (MoU) to strengthen the partnership with the aim for Zilzar to become the preferred platform for halal B2B e-Commerce which would involve commitment from Zilzar through thought sharing on halal digital landscape and access to e-store on Zilzar platform with KLMCC's members. KLMCC will in turn, promote and encourage their members to have a presence on Zilzar platform. Dato Dr. Vaseehar Hassan bin Abdul Razack, Chairman of Zilzar launched his book entitled ‘Malay Leadership Mystique’ on December 1, 2016 in Kuala Lumpur, Malaysia. The Malay Leadership Mystique is a pioneering and exploratory work to understand the Malays and their leadership qualities. The book was officially launched by Tan Sri Dato Seri Utama Arshad Ayub, Chairman, Board of Directors University Malaya, at TPC Kuala Lumpur. The event saw 200 Malay leaders from both the public and private sectors in attendance. The Malay Leadership Mystique is based on Dato Dr. Vaseehar’s PHD research to understanding the qualities of Malay political and business leadership and unearth among others, the reasons for the lack of success of the Malays especially in the economic activities of the Nation. Agro Trade MAHA 2016 is a leading Agro Fair in the region focusing on innovation and the progressive development of the Malaysian Agro-Food and Agro-Based Industries. Zilzar is honoured to be named as the official Ecommerce partner for this year’s event. Set as a biennial affair, Agro Trade MAHA 2016 is strategically positioned to promote Malaysia as the center of excellence in agriculture and agro-based industries, incorporating agro-based knowledge, technology and innovation, agro-trade, agro-tourism and agro-lifestyle. The Maldives Islamic Banking & Finance Industry Conference (MIBFI) was held for the first time on a beautiful island resort, in Bandos, Maldives. The conference was held on November 17, 2016 for the third successive year and deliberated and discussed means of enhancing Maldives’ position not just within the South Asian region but also even beyond. Maldives is seeking to position itself as a Centre for Islamic Finance, targeting institutions from all over the world to consider Maldives as an option to base part of their operations. Zilzar was proud to be the official Halal Ecommerce partner for MIFBI 2016. 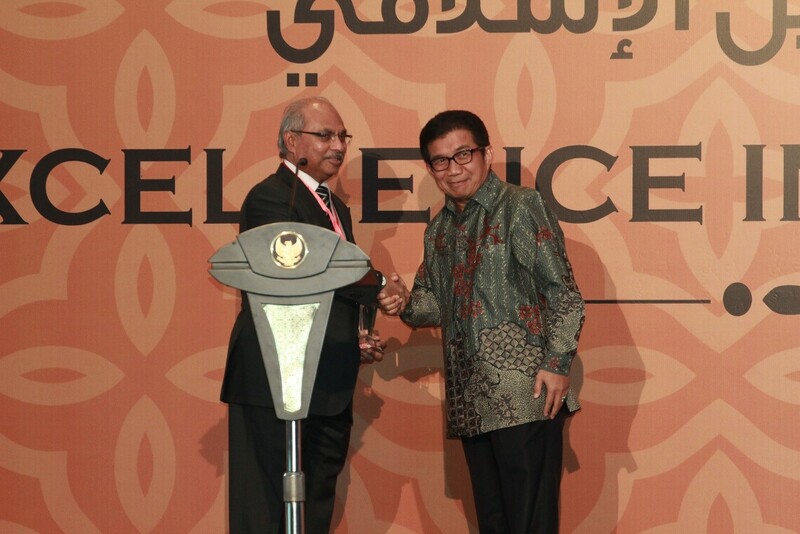 Dato’ Dr. Vaseehar Hassan, Chairman of Zilzar (left) receiving the ”Best Halal Industry Technology Platform 2016” Award from Muliaman D. Hadad, Chairman of OJK Board of Commissioners. Kuala Lumpur – Zilzar Tech Sdn Bhd (Zilzar), the first global Business to Business (B2B) Halal e-Commerce platform that connects Buyers and Sellers announced today that it has been named a Winner for Best Halal Industry Technology Platform Award during The Global Islamic Finance Awards (GIFA) 2016. The event was attended by H.E. Joko Widodo, President of the Republic of Indonesia, who also received the prestigious "Global Leadership in Islamic Finance Award 2016”. The GIFA 2016, organised by London-based Edbiz Consulting, is the leading best practices award ceremony in Islamic banking and finance and celebrates the success of institutions and individuals, with an ultimate objective of promoting social responsibility, Syari’ah authenticity and commitment to Islamic banking and finance. Zilzar, launched in October 2014, has excelled in its category, Our vision for the halal industry is to build and promote a platform based on integrity, trust and confidence that connects SMEs globally with halal products and services to buyers.” said Dato’ Dr. Vaseehar Hassan, Zilzar’s Co-founder and Chairman. “This award is a testament to the skill, ingenuity, and vision of its founders and most definitely its team’s extreme commitment. It is a great honor to be chosen for this award knowing that our effort has been recognized significantly,” he added. Zilzar was honored at the GIFA 2016 Awards ceremony held on 29th September 2016, in Jakarta Indonesia. Having achieved this impressive milestone, Zilzar is set to explore into bigger challenges to address the demand of the growing numbers of Muslims who are now spending more than $100 billion a year shopping online. As a result, the company plans to expand and open its regional office in Jakarta by end of this year. Petaling Jaya – Business-to-business (B2B) halal e-commerce company Zilzar Tech Sdn Bhd has bagged the Best Halal Industry Technology Platform Award at The Global Islamic Finance Awards (GIFA) 2016. In a statement yesterday, Zilzar co-founder and chairman Datuk Dr Vaseehar Hassan said the award was a testament to the skill, ingenuity and vision of its founders, as well as the team’s extreme commitment. GIFA 2016, organised by London-based Edbiz Consulting, is the leading best practices award ceremony in Islamic banking and finance and celebrates the success of institutions and individuals, with the ultimate objective of promoting social responsibility, syariah authenticity and commitment to Islamic banking and finance. Launched in October 2014, the company said in the statement that it is exploring bigger ways to address the demand of the growing numbers of Muslims who are now spending more than US$100bil a year shopping online. Dubai – Zilzar.com (Zilzar), the world’s first global Muslim Lifestyle Marketplace platform for information, content, community and trade to target the massive $2.5 trillion Muslim consumer market, was launched during the 10th World Islamic Economic Forum in Dubai by the Malaysian Prime Minister Dato’Sri Mohammad Najib Tun Abdul Razak. Zilzar is a B2B and B2C global information, content, community, and trade platform for the Muslim Lifestyle Marketplace consisting of eight silos:$1.1 trillion halal food/beverage, $1.4 trillion Islamic Finance, $224 billion clothing/fashion,$151 billion media/recreation, $137 billion travel/tourism, $70 billion pharmaceutical, $26 billion cosmetics and $15 billion logistics, based on 2012 capital expenditure. The Muslim Lifestyle Marketplace, encompassing the 57 Muslim countries with a population of 2.0 billion, plus the 100 million Muslim outside the Muslim world, all living in an external environment of rising per capital income, internet and mobile phone penetration and commerce, represents a growth opportunity. Zilzar has identified a market-based solution for millions of globally dispersed Small Medium Enterprises (SMEs) that are resource challenged but want to grow by expanding intra-country markets, accessing new markets and customers, and counter-part buyers that want to deal only with credible and certified sellers. Zilzar will provide robust e-knowledge, information and content for users, sellers, buyers, and halal certification bodies, with e-souq, sellers will have free digital store-fronts. Zilzar’s technology platform has been built using the most contemporary technology and usability standards like flat design and responsive layouts. Much like leading social networks, the buyers and sellers can follow each other and never miss a deal, making it the world’s first trading social network. Zilzar has partnered with MasterCard Worldwide to offer payment services for buyers and sellers, providing security, trust and convenience for the marketplace. Published annually, the ISLAMICA 500 is a business guide providing hard-to-find biographical details for 500 of the world’s most prominent and influential personalities in the Islamic world and economy. This year, Co-Founder and CEO of Zilzar, Rushdi Siddiqui has been named as one of the top 50 global leaders who have had an outstanding achievement in the Islamic economy. The ISLAMICA 500 is intended to enhance and facilitate business between global leaders in the Islamic Economy. It is a worldwide independent publication. Zilzar Life launched its dedicated Bahasa Indonesia section on the 30th of September 2016.This section will be uniquely targeted towards the Indonesian-speaking community especially for those in Indonesia, Malaysia, Brunei and Singapore. Zilzar Life is a content based website with a special focus on Muslim lifestyle which also acts as a traffic feeder to Zilzar B2B e-Commerce platform. The tagline for Zilzar Life is ‘Connecting Muslim Millennials’ as it captures the information and lifestyle content consumption of the digitally active Muslims. It features articles on modest fashion, halal food, halal travel, people, trends and anything related to the Muslim lifestyle space. Currently, Zilzar Life has over 70 Writers and content partners from all around the world and is constantly looking for Content Contributors that focus on Muslim lifestyle.